I'll admit, I thought that last rally had "done it." I thought it had accomplished its goal and flipped the final bears, and sucked in the last of the bulls who'd come late to the party. I figured the market wouldn't reward those late-comers. I was wrong. I should have known better. Right now I'm hearing a narrator in my head -- that deep-voiced fellow who does movie trailers -- and he's saying: "Coming this October to asset prices near you, the Fed gets revenge in: Lender of Last Resort III: A Fistful of Fiat Currency." 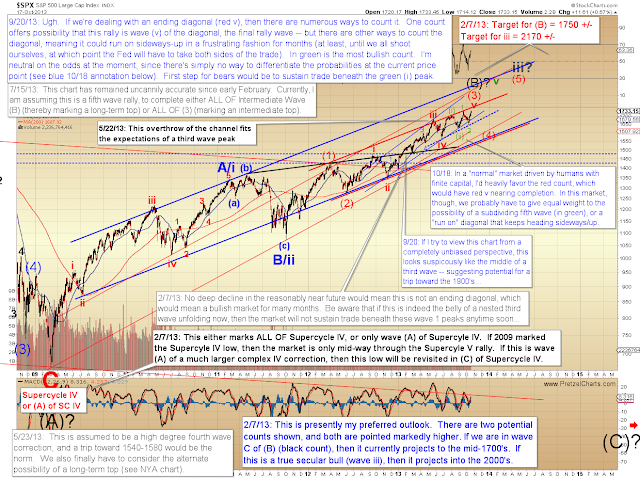 The market has now traversed into price territory where a myriad of possibilities open. Elliott Wave Theory can really shine at times, and there are moments I can project the market's next move with high probability. But at times the market enters into a the equivalent of a blind spot -- and you really can't see what it's planning until it begins to emerge to one side or the other. I think the temptation with any trading system is to push it beyond its limits and try to anticipate every single move -- but no system (I know of) can actually do that. 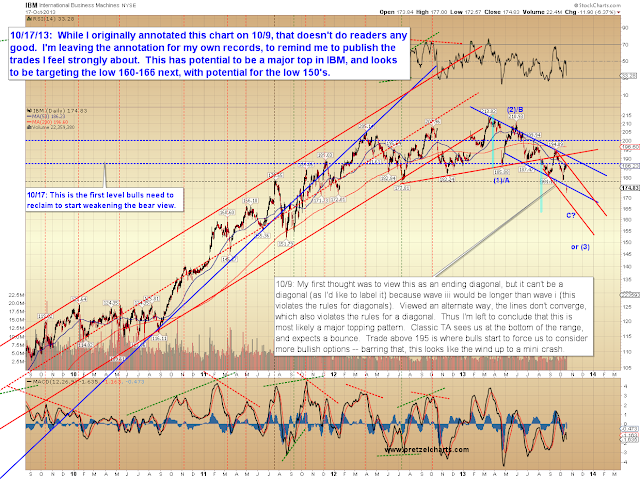 We're still in price territory where my original long-term count from February was suggesting a top could form (1750 +/) . That target was calculated using several methods, so we should probably allow it room to see if it plays out -- but I have to admit that I'm not sure how well the near-term wave structure supports an ending diagonal here (see chart below), so I'm entirely open to a more bullish resolution. 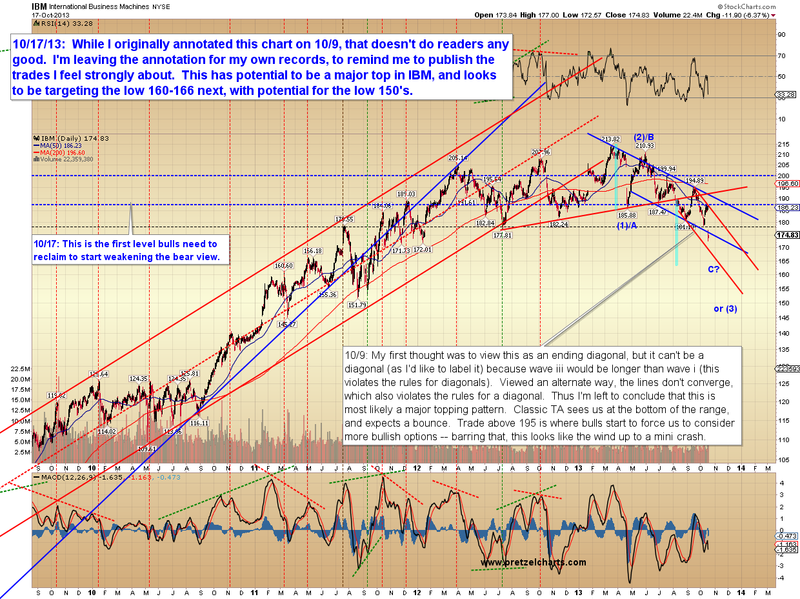 We'll have to see how the market looks emerging from this blind spot. Interestingly, based on near-term calculations, sustained trade north of 1750 is where I'd largely rule out the immediate ending diagonal (shown in red). Beyond that level, and we're likely in for the more bullish resolution, which presently could take the form of a more extended sideways-up that frustrates everyone, or a more rapid blow-off move higher. And again, this should be determinable as we emerge from the current blind spot. I want to publish two quick updates on other markets. I've been kicking myself for not calling everyone's attention to IBM, which I noted personally for my own trading, and almost published on October 9; this is one of the charts that kept me leaning bearish on the broader market (wrongly, as it turns out). 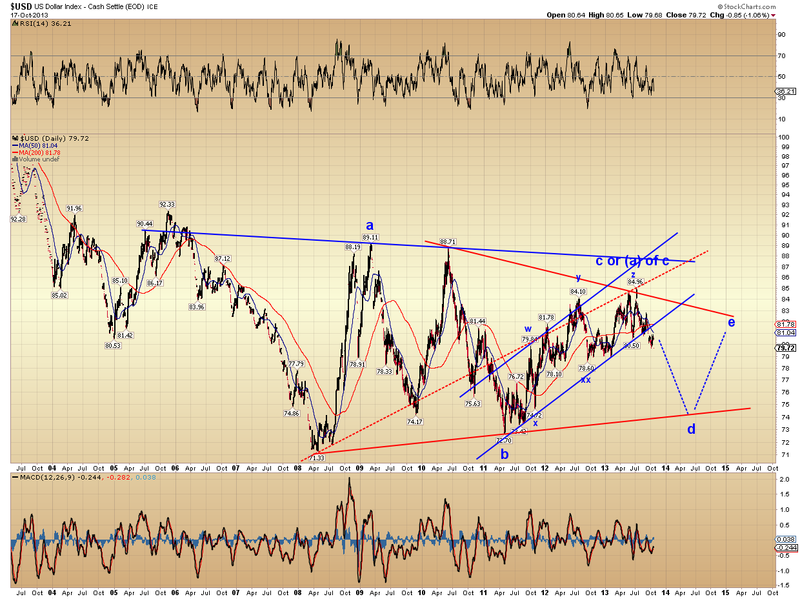 I couldn't see any way to view IBM bullishly on that date, and I still don't see good odds for an immediate bottom here. The decline doesn't look finished. With that lesson in mind, here's a chart of the US dollar, which has been looking triangular-ish (of course that's a word!) for some time now. This triangle could be flipped on its head (making it long-term bullish) and it wouldn't matter in the least for the foreseeable future: both the bullish and bearish version of the triangle would grind sideways in a similar fashion for at least another year. As I noted last year when I flipped my stance from dollar-bullish to dollar-neutral, it's really hard to view the rally from 72 as anything other than a corrective wave. The first step for dollar bulls to make this chart look more encouraging would be to reclaim the broken support zone at the blue trend line. In conclusion, as I mentioned in the last update, I don't feel the (now actually reached) new all-time high is reason for complete capitulation of the bear case just yet, but I'm not going to stubbornly cling to that view either. Viewing everything with as much objectivity as I can muster, I'd say equities have entered territory where bulls and bears have roughly equal odds at the moment. The good news is equities should emerge from the current blind spot relatively soon, and allow us to assign higher probability to the next move. In the meantime, trade safe. your work is greatly appreciated. thank you. After the expected post-cliff rally, I'm expecting the market to take a breather by the end of the month.